The Koskela team’s go-to getaways, all within two hours of the big smoke. Sydney is a fabulous city but every so often it’s nice to escape. Luckily you can drive a couple of hours in any direction and there is a magical spot to pitch a tent. We asked the adventurous Koskela team for their favourite camping spots near Sydney and here are eight locations that will get you up close and personal with mother nature. Bouddi National Park; 60km from Sydney. It’s a 750m walk from the carpark at the end of Graham Dr off The Scenic Rd to this campsite, which has 6 tent sites, as well as non-flush toilets and gas/electric BBQs. Fires aren’t permitted and you’ll need to bring your own water. The track in isn’t to rough; NPWS suggests you roll your camping gear in by wheelbarrow – should you happen to have one handy! Ku-ring-gai Chase National Park; 40km from Sydney. Camping for 400 visitors is permitted at this area only, near West Head. Vehicle parking is on West Head Rd; from there, it’s a 2.8km walk or cycle to the campground. There is also access by water, via private boat, ferry or water taxi from Palm Beach Wharf. Bring your own firewood. If everything is booked out, alternative accommodation is available at a YHA hostel at Morning Bay. Marramarra National Park; 65km from Sydney. Munmorah State Conservation Area; 100km from Sydney. The 6 sites here each fit 6 people, and you can stay for a maximum of 2 weeks. 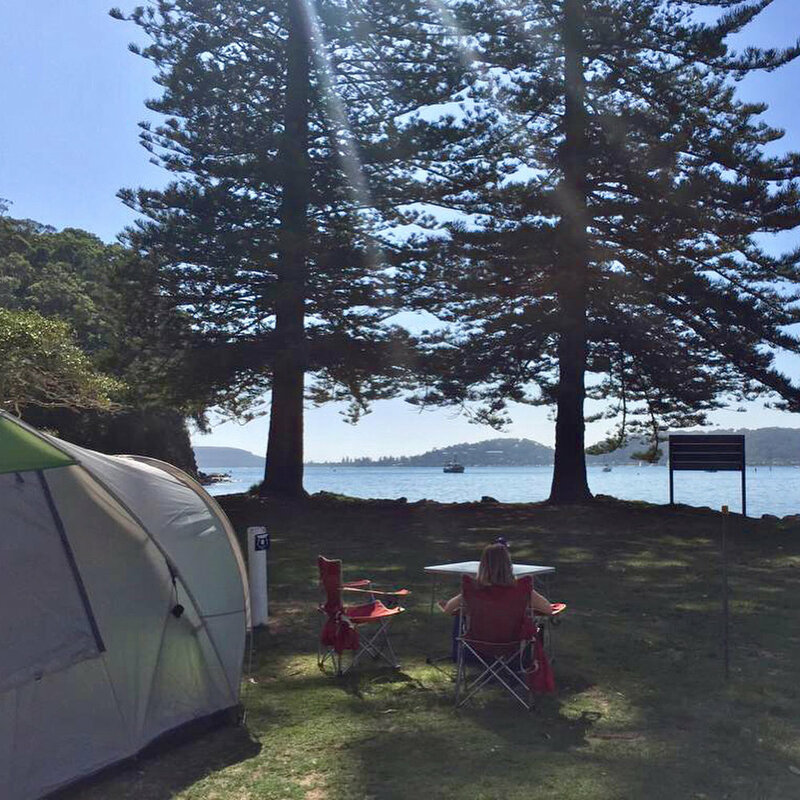 The campground is nestled in the Frazer Valley, close to the beach (only patrolled during Christmas and Easter holidays) and Snapper Point, a popular fishing spot. To get here, turn onto Frazer Beach Rd off Campbell Dr in the northern section of the park. It’s a sought-after camping area in peak periods; bookings can be made up to 3 months in advance. Bring your own drinking water. This is a simply gorgeous bush camping area in Blue Gum Forest in Grose Valley. The modern conservation movement is reputed to have been born in this forest, and after a night spent sleeping beneath the majestic blue gums, you’ll see why. It’s a steep and strenuous walk in and out, however, and you need to be self-sufficient in gear, food and water. If you take water from the creak, boil or treat it before drinking. Note: gas/fuel stove only. Blue Mountains National Park; 115km from Sydney. Located in a spectacular setting with escarpment views below Katoomba, Dunphys camping area is one of the best in the Blue Mountains. The site’s openness catches the warming rays of the sun any time of year and provides spectacular sunsets. The 45km Six Foot Track is accessed from Dunphys. You reach Dunphys via Blackheath. Coming from Sydney, turn left off the highway into Bundarra St and then Station St, right onto Shipley Rd and the left onto Megalong Valley Rd. Follow for 19km, passing through private gates (be sure to leave them as you found them). Bring your own water. Royal National Park; 35km from Sydney. On the stunning 26km Coast Track (2 days, medium difficulty), this is a walk-in bush campsite with 12 sites. You’ll need to be self-sufficient; bring food and drinking water with you. Wood fires are not permitted. Access is from Otford or Bundeena at either end of the Coast Track, or from the carpark at Garie Beach. In the picturesque Kangaroo Valley, 20km north of Nowra and 8km west of Kangaroo Valley village, Bendeela is a hidden gem in a treasure chest of natural beauty. Camp in a secluded, shady grove next to the Kangaroo River and let the kids splash around in the river. Note: no open fires allowed here; gas stoves only. Information about these campgrounds was extracted from Camping Around Australia, Australia's most comprehensive camping guide. You can shop this book and other camping gear on Koskela's online store.